The Imperial Gunnery - We find your lack of variant knowledge disturbing. Some great ideas here. Let's keep them coming. Repros, we don't serve their kind here. I like the idea for the back!!! 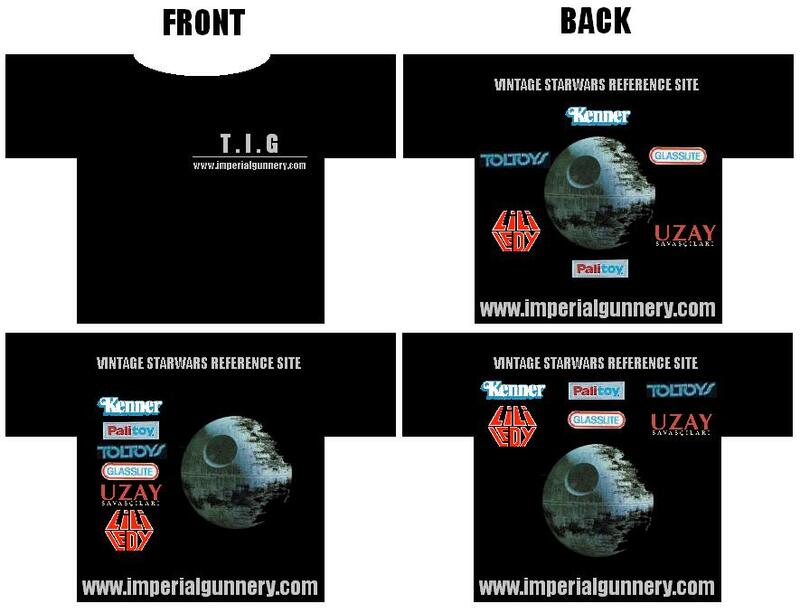 its the imperial logo with "The Imperial Gunnery" written in the Imperial Font wrapped around the top of the logo, and in galactic basic on the bottom. then going across the logo is a banner with the date the site went live!!!! Whats even better is that all those company logos use the same colors... which would cut down on shirt printing costs!!!! once you get passed 1 printed color every additional color costs more $$$$$$$$!!!!!!!!!! I wonder if I could has my cousin if Hasbro would send us some $$$$!!!! Those look great. My fav is the top back with the company names going around the Death Star. Heres another thought, which I think was brought up before. When we decide on what style we want, how about taking an order for the shirts and just print up those for now. That way everyone contributes to the cost of what it ends up as instead of one person paying the whole total. If you want your name on it, take it to a local screen print shop and get them to do it, thats what I'll do. So, say we order 30 tees for the members who want one and the cost comes out to $400 total, everyone foots $18.00 per shirt which will help cover costs of printing and shipping them out. Personally..I wouldn't wear a shirt like that..way too much going on on it..Simple is best IMO. I decided to take a stab at a shirt idea. The shirt is kinda contradictory don't you think...it is a site that focuses on identifying repro's after all! Yeah so they can be burned. It was just one idea. I'll see about coming up with some more that might work better. Here is another one, but it doesn't have a slogan, but I think it helps with the site purpose.